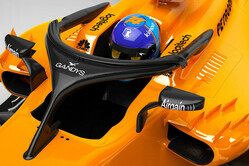 Bearing in mind the Halo device resembles the upper part of a flip-flop, McLaren has struck-up an inspired partnership with British lifestyle brand Gandys for next week's Australian Grand Prix. Gandys was founded by brothers Rob and Paul Forkan, who were inspired to start the brand after tragically losing both their parents in the Tsunami that affected much of southeast Asia in December 2004. The Gandys brand began with a single flip-flop design, with its initial success enabling Rob and Paul to achieve their goal and open the first Orphans For Orphans foundation kid's campus, in Sri Lanka in 2014. Alongside their charitable foundation, the Gandys brothers have continued to grow the brand since its inception in 2012. Gandys introduced full menswear and womenswear collections to the brand in 2016, and continue to support Orphans For Orphans by donating 10 per cent of their profits to the foundation. The second campus was opened last year in Malawi, with plans to open more across the world. For the Australian Grand Prix, Gandys branding will feature on both McLaren cars. Today's announcement means Gandys will become the first brand to take advantage of the unique shape of the new-for-2018 Halo cockpit protection structure, which has frequently been compared to the distinctive upper of a flip-flop. Additionally, Gandys and McLaren will collaborate to create a limited-run ‘Halo-edition' flip-flop, with 100 per cent of all profits going directly to the Orphans For Orphans foundation. They will be available from gandyslondon.com and all Gandys' London stores, as well as through mclarenstore.com. "We're delighted to have Rob, Paul and the team at Gandys join us for the Australian Grand Prix," said John Allert, McLaren Chief Marketing Officer. "The placement of the logo, on the MCL33's Halo, was not only perfect from a branding perspective, but also a great opportunity to underline Gandys' charitable commitment to providing a safer, more protective environment for those at risk. "Collaborating with Gandys on a limited-edition co-branded product was also a meaningful step for us. By giving 100 per cent of all profits to the Orphans For Orphans charity, McLaren is also able to help a very deserving good cause. "Showcasing this partnership in Australia, where we race just a stone's throw from Melbourne's beautiful St Kilda beach, just felt like the best possible opportunity for Gandys to showcase its brand and noble cause on the international stage." "We were absolutely thrilled when McLaren came to us with this idea," added Gandys co-founder Rob Forkan. "When the brand was created, Paul was living in Melbourne, and I went out to surprise him on his birthday to tell him about the idea for Gandys. After managing to persuade him to return to the UK and start the brand, it's really exciting to be going back. In fact, it will be the first time we've return to Melbourne, so it's great to feel we have come full circle! "By putting Gandys' branding on the car's Halo, we can help to strengthen the message behind our Orphans For Orphans initiative; creating a protective and inspiring environment for children at risk. It is a step in the right direction for the safety of the drivers and a great step for Gandys. "When we started Gandys we started working on a small scale, helping a few children. Now we are helping more and more vulnerable children all around the world. We hope the halo will have a similar impact in Formula 1, as we know that even if it only saves one life to begin with, it will go on to have a wider impact." "On a personal note, as huge fans of Formula 1 and McLaren, this was an opportunity that was simply too good to pass up. We can't wait to see Fernando, Stoffel and the whole team in action in Melbourne next weekend." "Please give pair to Alonso to wear while sitting in the beach chair when his Mclaren break down!" "So, maybe that's where the Halo idea is coming from, to sell some flip-flops. "